That’s right, you’ve just stumbled upon the opportunity to buy the entertainment value of a lifetime for about the price of a coupla packets of Chicklets! Your very own copy of the book. Free with every purchase! All of the words used within. ALL of them! And with this special offer, we’re also throwing in all of the punctuation marks. Just for you! A free digital image of the cover, suitable for use as the background wallpaper for your desktop (provided you take a photo of said cover, transfer it to your computer, choose “print screen,” re-size it – and then add it to your desktop yourself). Well okay, so I lied. There really isn’t anything more. And yet, amazingly, you can still get your hands on this work of genius for the stunningly low price of just three dollars and seventy-five cents! I mean, come on! Three Dollars and Seventy-Five Frickin’ Cents! That’s less than a Triple Grande Latte at a Tokyo Airport Starbucks. Less than the Congressional budget for a B-2 Stealth Bomber. Less than the aggregate construction costs of the Large Hadron Collider. And yet capable of delivering almost as much entertainment. I mean, we’re talking three dollars and seventy-five cents, people. It’s barely worth stealing. Hell, I’ll bet if you drove off from a bar with some buddies and then suddenly remembered “Holy Crap! I just left exactly three dollars and seventy-five cents on the counter!” – you wouldn’t even ask them to turn around so you could go back and grab it. Well, would you?! WOULD you?!! No, you wouldn’t. Nor would they likely turn around even if you did. Why? Well, I’ll tell you why! Because it’s only three dollars and seventy-five cents, that’s why!! It’s not worth it! I’m telling you, man! It’s just not! But trust me, “The Re-Org” is. Hover expectantly over it for just a moment or two. 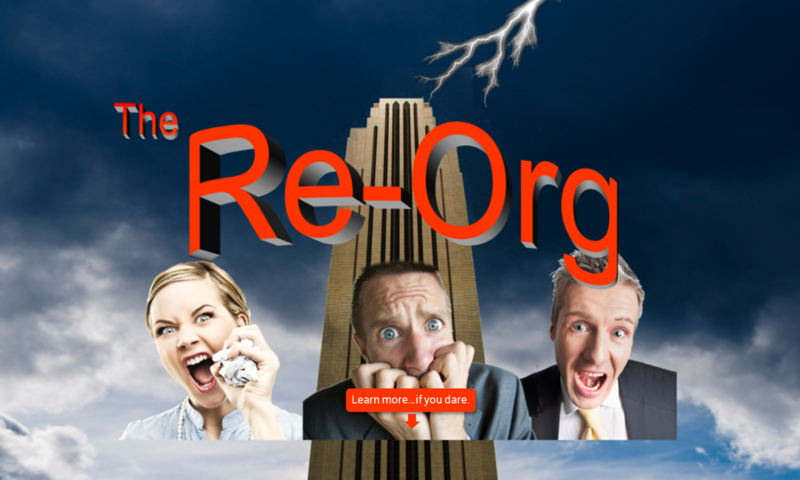 And then click on that little sucker and buy your copy of “The Re-Org” today! Gahh! What are you doing?!! Stop reading this and go buy it!!! !